Let's just hope that Gerald Ford doesn't kick the bucket anytime soon. Would hate to have the eyes of the world on GR and have only a crumbling infrastructure to show them. Frankly, I find it appalling that our "front door" (the river) is still a mess in August, when the snow jam was here in February? How long does it take? Where are our priorities? I have been twice and loved it each time. That is cool. I think the area between Pearl and Fulton would be a prime attraction for something cool. Fountain show, laser lights, fire (like described). Something that would draw people to the banks in the summer. I have thought for a long time that they could do some cool stuff to draw people to the river (How about a REAL bandshell in front of the Gerald R. Ford Museum, with REAL concerts). Hopefully the new Marriott will showcase the river and not turn its back on it. That's great to see. I never new it was in such bad shape. This may be a small start, but GR just had the 2nd Annual "Isn't it Grand, Lending a Hand" event on Saturday. It's basically a river clean-up event, where people (I think there were around 65-75 this year) throw on rubber gloves, grab orange GR City waste bags and clean up the junk that collects all along the Grand River - from downtown to Indian Mounds and I think there was a group that even went out to Plaster Creek. 1-800-GotJunk volunteered their services to pick up all of the junk and we try to recycle as much glass and metal as possible. According to WMEAC, there was less junk to pick up this year compared to last year - quite possibly because it's not as easy to litter when the area has been cleaned up. The discussion is great - but this is an easy way to put some of these thoughts into action! I concur that I don't think it's that bad. It could use some cleaning, and it is very frustrating to see some of the boardwalks always closed off (at least when I head down there), and yet GRDad hit it on the head early on when he mentioned how high this river rises at times. I live in Grandville right now, and have quite often seen, not only the natural banks, but good old Butterworth Road covered up as well. And how often have we been downtown in the spring, only to see our beloved Boardwalk underwater? It can be tough to place parks right near the river (Riverside Park) knowing they will be flooded each spring. I personally would like to see more living/condos on the river, and less industry or vacant lots (Front). It is a shame that once we hit near Market or Wealthy, any visibililty to the river comes via a Cessna, until we hit our wonderful wastewater treatment plant. Sadly, we have turned our backs on the Grand River. Actually, there was a group of Rhoades scholars studying urban planning in GR a couple years back. They were along the banks of the river looking out over downtown from the west side. They were viewing GR as a great example of how a downtown can embrace its River. Unlike many river cities, we have lots of downtown public parkland that faces the river, we have the pedestrian only bridge; We have the fish ladder providing a unique river experience to the public; We have museums which make great use of the riverfront. I hardly think you can say we've turned out backs on the river. Sure we don't have boats.. but compared to the average Midwest river city, GR has made incredible use of the river, and most of it is accessbile to the public, not privatized. Sure, the waterfalls prevent boat traffic.. but compared with the sad neglected concrete walled channel that one would find in say, Hamilton Ohio.. GR is an example to be followed for how to embrace a river. The city seems to have sporadic (if even nice when it happens) connections to the river, but I wouldn't consider it an example of what to do with a river/waterfront. The river in the city still has so much untapped potential. I'm really not trying to be down, but for a city built on the river like it was, I've always wondered why it is so underutilized. I mean, the city derives its name directly from the river its own, and that river's features. I think a riverfront boardwalk, with specialty retail along said boardwalk, would be an excellent use of the riverfront. Although, it seems as though this is supposedly a part of all the river grand proposals? Eh, its like the boardman river in Traverse city and the lake (boardman lake) it runs into, most people just dont use it at all. It is something of value that gos underutilitized and therefore under appreciated, although they do have the bay to play in. It would be nice to see more on the river but how much can you actually do with a shallow river? Fish and thats about it. If someone would pony up the dough to have it dredged we may see that riverboat that sits down by the sewage treatment plant toward grandville strolling up the river. After living here almost 3 years I never walked down by the river other than eberhard center and I was dissapointed. Graffiti everywhere, as mentioned earlier, most of it was closed off, and even if it wasnt there is nothing to do but walk. They need rows of trendy shops and restaraunts facing that direction to draw people to the river. Most people dont want to drive downtown just to take a walk. Maybe the proposed theatre will spark some life down by the river. Also they need to change the bridge lightbulbs. only about 1/3 of them are light up. Whats up with that? When I was down there taking pictures last week, they were working on the lightbulbs of the blue bridge. I think overall GR has done a good job in regards to the river. 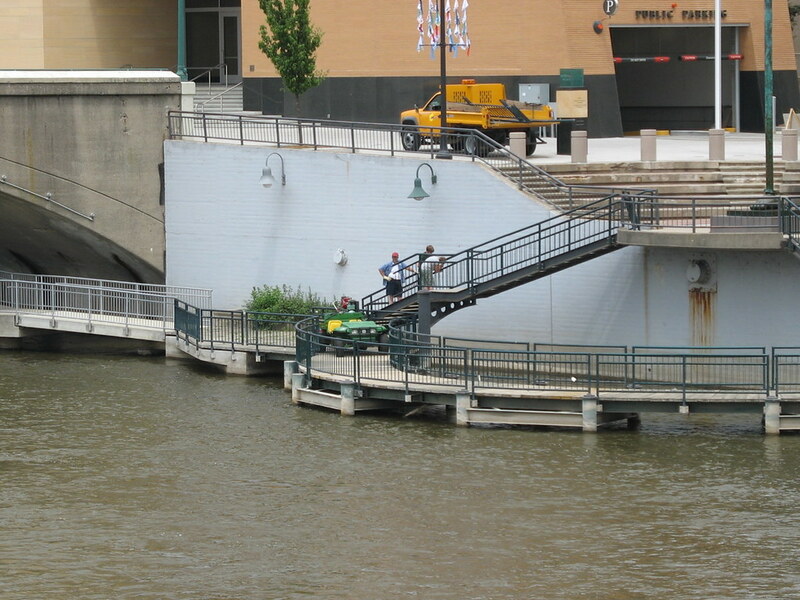 In Lansing, about all we have is nice, well maintained boardwalk and parks along the river, through downtown I can't think of a single building that utilizes the river, theres even a large part of the riverfront taken up by a parking ramp. Things are getting better here, over time there will be more buildings that utilize the river and in GR it appears their attempting a riverwalk. 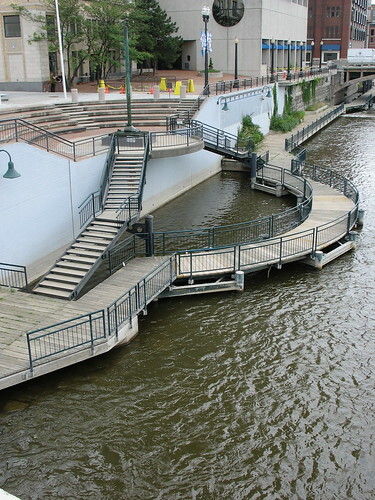 At least building a nice riverwalk is much easier than what Lansing has to do, convince developers to build entire new buildings to better utilize the river. I don't think people can say the Grand River was "underutilized", especially with the word "Grand" in Grand Rapids. 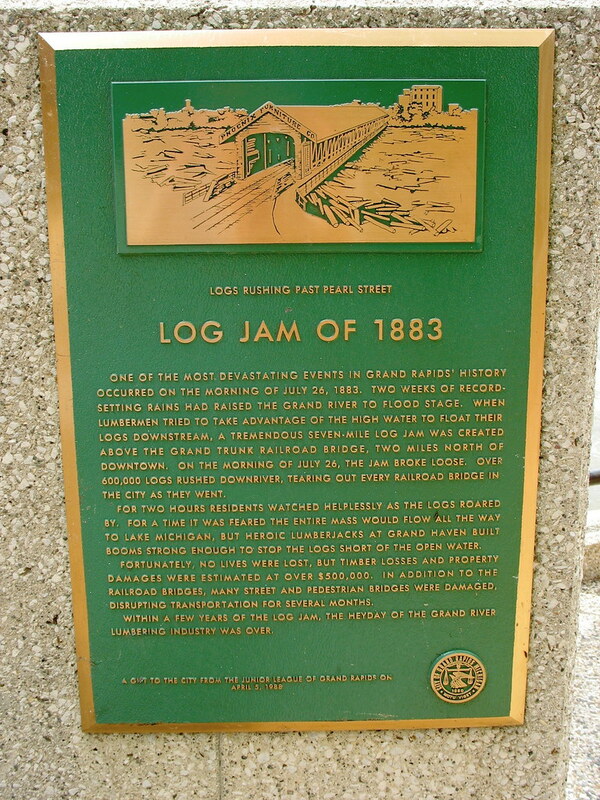 The Grand River drove much of the furniture industry in the late 19th/early 20th century. It was heavily used to float logs down the river to feed the insatiable saw mills. Someone here posted some very old photos showing the factories lining the riverbanks. Unfortunately it's taken a while to convert it to more recreational use, but GR has hardly turned its back on the river. It's good to see they're replacing the blue bridge light bulbs. Correction Occam, we have TWO pedestrian only bridges. I love heroic lumberjacks. There's not enough of them. I do love seeing our blue bridge lit up at night, especially when flying down I-196. And it is a good idea to have "trendy" stores on the river, or something where people can head towards the river area and be entertained (like all the new proposals I suppose). In reflection, I had a good time a few weeks ago just sitting on the grass in front of the Ford, down near the river. There were 3 of us, and we were all shocked that, apart from the carriage rides, we were the only one's down there, just sitting there, at about 3:00 on a Sunday afternoon, just relaxing. Now Festival was going on, but we thought that more people would have been there b/c of that. It was rather surprising how many people won't leave their air-conditioning anymore to travel outside. Plus side - we saw quite a few families checking out the statues, so that was cool. We were one of those families checking out the Otterness sculptures. We all left the city commenting that GR has done an above average job of embracing the river. Not perfect, but it seems that most of the newer downtown buildings pay their respects to the city's namesake. Charley's Crab has a lovely view of the river and in the summer you can sit on the deck and look at it/smell it rolling on by . . . .
Get rid of the low boardwalk... and think of another way. As far as I know it seems as though The River doesn't like anything in its way, especially in the spring time when its above flood stage. We need to think of a better way. Also, where do we put these boutiques and shops? We can't move the convention center, Grand Plaza, Marriott, Forslund, Art, Steelcase, and Plaza Towers; these properties nearly sit directly on the river. I would probably try to integrate 6th St into this kind of concept. Once you're North of 196 you have a great opportunity for a combined commercial and retail development. It seems that we are expecting to be able to do more with The River then what is possible just because other cities are doing it. Every river is different. Agreed. The area North of the Fish Ladder is some of the best areas of redevelopment. The dam there makes the river more like a big pond--calm and serene. But it's not narrow like the rivers in Chicago, San Antonio or Providence. The Grand is a MAJOR river, a glacial tributary, so it's W I D E in some spots causing the banks to be pretty isolated from each other, especially north of 196. I think there is great opportunity to build at least two great neighborhoods up there, more shops, bars, parks, and tying the banks together with more fun/interesting pedestrian access and crossings. Maybe a bridge with a platform in the center for people to gather?